Late check out (after 1:00 PM and before 2:00 PM) may result in a fee. Notification of cancellations/amendments can be accepted via fax or e-mail to e-mail: booking@regentsuvarnabhumi.com only but they will not be guaranteed. Any cancellations received less than 3 days before arrival will be subjected to a cancellation fee, in the amount of 1st night charge. Any booking amendments made within 3 days of arrival results in a cancellation fee and will not be eligible for reimbursement. Please be advised that unused nights will not be refunded and full period charges will apply, unless specifically directed by hotel manager. We display all the hotel specific Cancellation Policies applicable to the period of a booking. When a cancellation is made,we will manually apply the appropriate policy, based on period, proximity to arrival date and hotel charge. In the event of failure to give the required notice for cancellation and reduction in accommodation numbers, the resort reserves the right to charge a fee equal as same as No Show Policy. For guest(s) check out earlier from original booking, Resort reserves the right to charge for actual total nights stay reserved without valid reasons. In the event of no-show, the resort reserves the right to charge a fee equal 100% for the entire value of the bookings. By placing a booking with us (the property owner / his/her representative) you (the lead guest) and your booking party (guests) agree to the following terms and conditions as set-out. During your stay you agree to abide by the subsequent conditions as set-out. If you have any questions about booking with us, please contact us before making a booking. To place a booking with us the lead guest must be at least 16 years of age. The maximum number of staying guests per room is illustrated in the room occupancy details on the website. Where the person making the booking is different to the lead guest taking up the occupation, the person making the booking may be held responsible for cancellation, non-arrival and damages as set-out within. Only the lead guest and the named booking party are allowed to use the property and its facilities, any third party visitors are only allowed access at our express permission. Payments can be made online / over the phone using debit / credit card as well as by digital bank transfer, or cash deposit. All guests agree to respect the privacy and peace of all other staying guests, neighbours and the owners at all times. We reserve the right to cancel a booking with immediate effect if guests are not honouring this agreement or causing a disturbance / nuisance to other guests, neighbours or the owners. In the rare event we need to cancel your booking with us, please be aware that we cannot be held liable for circumstances beyond our control and that our liability to you is limited to the refund of any payment already made. Where WiFi Internet access is provided, guests accept to use this access to the Internet fairly and appropriately. We may monitor network performance and user usage in order to maintain a fair and high level of service to all our guests. The Internet access provided is intended for general use such as access to the world wide web, email, messaging, social media, light video / music / media streaming. It is not intended or ideally suited for heavy media streaming, online gaming, extensive downloads / uploads. Access to illegal activity or use of our network for illegal activity is not prohibited and will be reported to local authorities. We reserve the right to charge the lead guest for any damages caused through the course of a booking by any member of the booking party. This includes breakages, spillages, stains, damage to furniture or fixtures and fittings. Any accidental damages should be reported as soon as possible in order to minimise damage and associated costs. Lost keys / fobs / access cards will incur a replacement charge per key / fob / card lost. Any lost property, if discovered and found, left behind by guests during a stay will be held for a period of 1 month. While we will make our best efforts to reunite lost property with their owners we accept no responsibility in replacing lost items and encourage guests to ensure they have all their belonging before checking-out. We may offer to post lost items via recorded delivery at the cost of the property owner, otherwise collection can be arranged. Smoking of any tobacco products including, but not limited to cigarettes, pipes, cigars, snuff or chewing tobacco, is only allowed in designated areas as sign posted throughout the accommodation. Please be noted that all our rooms are non-smoking. For any violiations, 1,000 THB fine will be applied. We do not accept pets throughout the accommodation. Where on-site parking is provided for guests and it is free of charge only for the period of stay. Guests accept that they park their vehicles at their own risk. We are required to keep a register of guests over the age of 16 who stay with us, this includes full names and nationality, and/or passport numbers, place of issue, details of next destination if they are non-British, Irish or Commonwealth guests. This is in accordance with the (Immigration (Hotel records) Order 1972). These records are kept for a minimum of 12 months and in accordance with the DPA (Data Protection Act 1998) and the GDPR (General Data Protection Regulation) [which comes into force in May 2018]. You accept that any entries you make to an on-site guest book, if available, will not contain personal information or details you would not want disclosed. Any entries containing personal details that may fall into the DPA and GDPR may be removed and destroyed. We reserve the right to cancel any booking without compensation, refund or reimbursement if the terms of these conditions are breached. 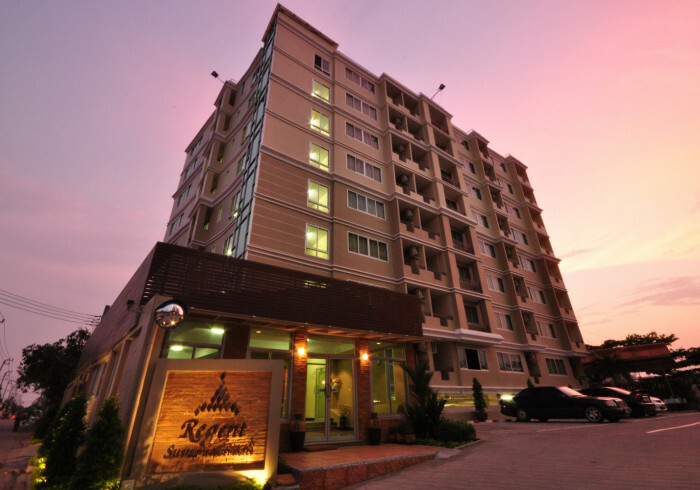 Conveniently located, Regent Suvarnabhumi Hotel is just a 8-minute drive away from Bangkok Suvarnabhumi airport and 25 minutes by car from Bangkok downtown provides spacious and comfortable accommodation. Rooms feature dark wood furnishing and are furnished with a small sitting area, a vanity and a 32-inch LCD television. It also has a kitchenette, ample workspace and free Wired & WiFi hi-speed internet access. Other amenities include a refrigerator and an electric kettle with instated coffee for guests in-room. Additonally, we also offer a-24-hour reception check-in and airport transfer services to ensure the ideal transit and stopver hotel in Bangkok airport area.